We all know how important it is to use sunscreen, but are you applying it correctly. 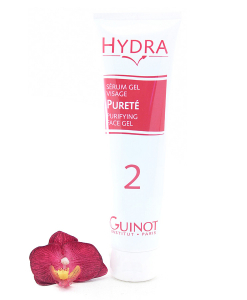 One of our favourite creams, Guinot Creme Solaire Hydratante – Moisturizing Sunscreen SPF20, is a bestseller but there is a few tricks to applying it and getting the best out of it. Completely indoor activities don’t require sunscreen, but many of us discount the sun that we get on a daily basis from just running errands and all the ‘incidental’ sun damage adds up. That’s why we recommend daily sunscreen application, so you are always protected and don’t have to think about it. That means even if you spend most of your day indoors. Indoor UV exposure can occur from ultraviolet that penetrates through glass, which is UVA. UVA is emitted at the same level — all day long — where is UVB, which is blocked by glass peaks mid-day. 2. For everyday wear, sunscreen should be applied to the face, as well as other areas of concern. Sunscreen should be worn on all over the face, ears included. Cover your entire face with sunscreen, as well as your neck and hands. If you’re not sweating a lot, you can just apply it first thing in the morning. The American Academy of Dermatology always recommends an SPF of 30, because it is clinically proven to be a sufficient amount of protection to reduce or minimize the adverse effects of sunlight. When used properly, there’s little difference between a sunscreen with SPF 30 or something with higher protection. However, in the real world, we do not apply as much sunscreen as we should, and we do not reapply. This ultimately means that the SPF value is diluted out. Starting out with a higher SPF to begin with serves as a safety net to ensure the highest quality of protection for the longest period of time. Ideally, sunscreen should be reapplied every two hours, or more frequently if you are swimming or sweating heavily. The best time to apply sunscreen is before you go outside because there are [fewer] distractions and you can make sure that you have adequately covered all exposed skin areas. As for how much, experts recommend about a thin layer on both the face and body, which equals a shot glass’s worth for the entire body and a dime-sized dollop for the face.
. This cream protects sensitive areas of the face from UVA and UVB rays. 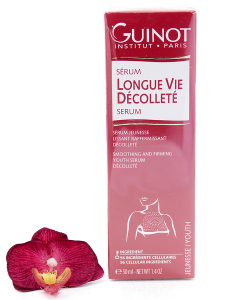 It helps to obtain an even tan while protecting the skin from the sun’s harmful effects. It does not leave a “white film”. 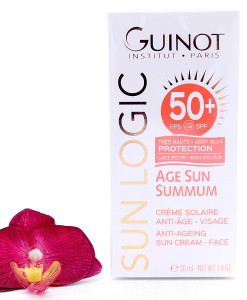 This entry was posted in Guinot, Sun Care and tagged Guinot Creme Solaire Hydratante – Moisturizing Sunscreen SPF20.